Buffalo plaid continues to be very popular and trendy for the holidays! I love making Christmas ornaments and created this adorable tree ornament out of buffalo plaid ribbon. In fact, to make this ornament you just need wired ribbon, Fabri-Tac fabric glue (it's a quick grab and dries in a few minutes) and heavy duty twine. Plus scissors and clothespins to help with construction. Let's begin by cutting out square ribbon pieces the width of the ribbon. This ribbon is 2.5 inches wide, so I cut out 2.5 inch squares. Next, grab the opposite corners and curve them around to the back in a cone shape - with a point at the top and a "V" shape flair at the bottom, as pictured below. Glue along the back edges with fabric glue. Use clothespins to hold in place while glue is drying. For this tree, I cut out 20 squares and made 20 cones. If you like, you can change the number of cones in each row - either have fewer cones on the top row or add more rows for the tree, etc. To connect the cones, first use a clothespin to hold the cones together at the top. Apply fabric glue between the cones at the bottom sides, matching edges and applying glue up midway. Continue to glue additional cones to each other, one at a time, grouping together. Use clothespins to hold together until glue dries. Don't glue the top points together just yet. Next, cut a 12 inch piece of twine and fold in half. Tie in knot making large loop (for hanging) on one end. Insert looped twine into first row of cones adjusting position just above the ends of the twine. Add glue around the twine and press the cone points together onto twine. Add second row above first row, staggering cones, following the previous steps. And finally, glue on the third row just below the knot. Makes for an adorable trendy tree ornament, don't you think! Just perfect for either rustic or traditional Christmas decor! 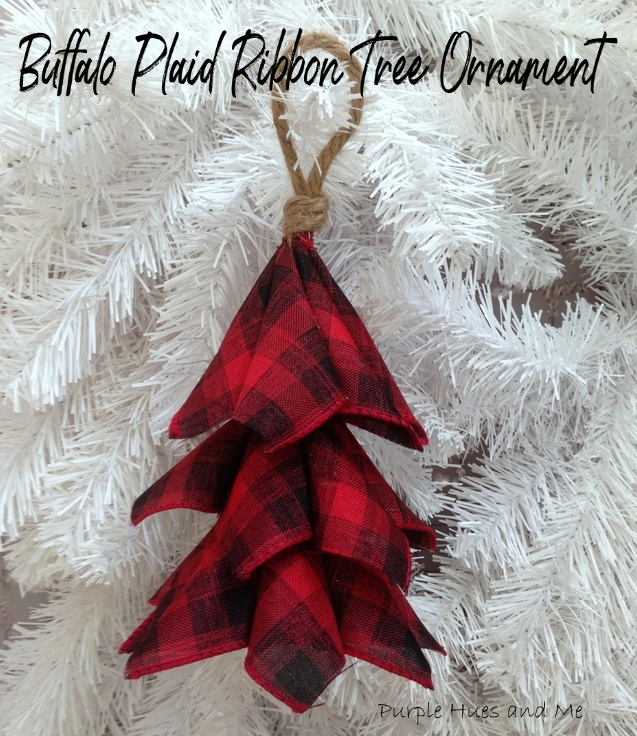 I'm sharing my buffalo plaid ribbon tree ornament tutorial at our Happy Holidays Link Party where I'm one of the co-hosts. 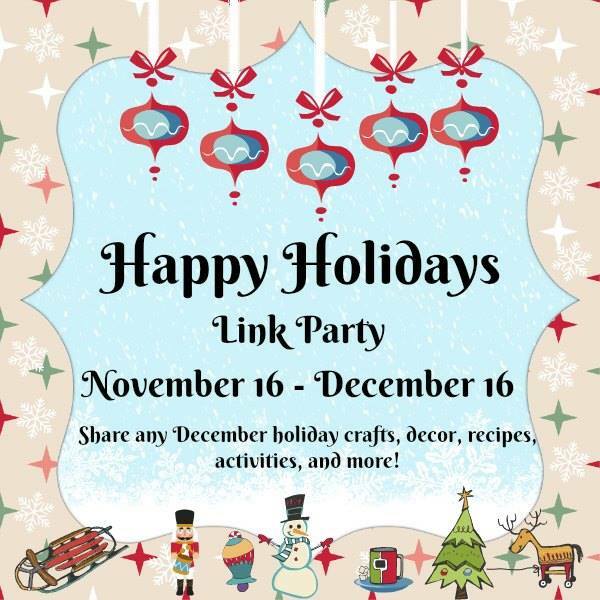 Please stop by and join us by linking up your holiday ideas and inspirations too! I love this, Gail. It's a fun, unique look. The tutorial is great! Adorable tree! I need some ribbon to try. I love the look of it hanging on the tree! These are really cute, I love plaid!! OH I love these. They would look amazing hanging from a string of garland. My son's room is done in this buffalo check. Love it. It's very cute and you give great directions. Such an adorable ornament! Pinned. Love this ornament! Can't wait to give this a try. Thanks for sharing the how too. Pinning. So pretty! Buffalo plaid does seem to be popular this year! This is so cute. The plaid ribbon really makes it. Thanks for sharing at the Snickerdoodle Create Bake Make Party. I love this ornament you made Gail. The plaid is all the rage this holiday season. I love it on the white tree. Thanks for sharing this at Cooking and Crafting with J & J. Have a Happy Thanksgiving. Gail, I'm going to feature your ornament at the Snickerdoodle Link Party this Saturday! This is so simple and cute Gail. I love the look of buffalo plaid, even my dog has a coat like that. Such a cute ornament and tutorial. I love the Buffalo check!